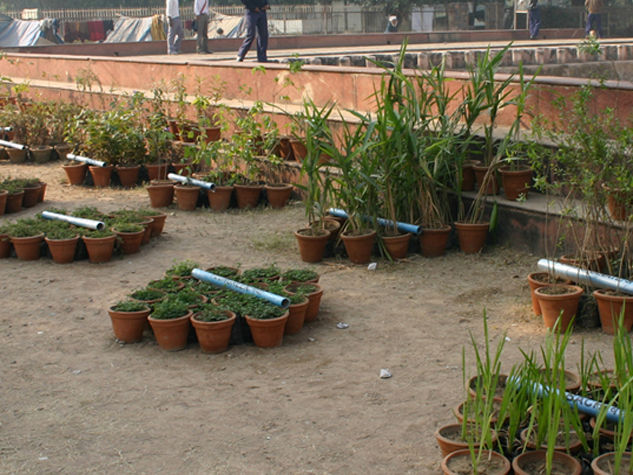 A temporary garden of medicinal plants–ayurvedic herbs, trees and bushes–was the focus of this project in New Delhi, India. The abstracted gardens found in the patterns of textiles and rugs were the visual basis for this temporary multi-part installation. 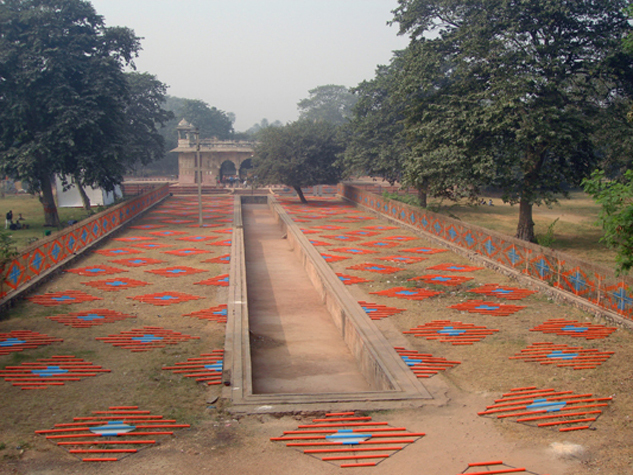 100 diamond-shaped units made up of evenly spaced orange pipes covered the grounds of a seventeenth-century Mughal pavilion in a city park in Delhi. 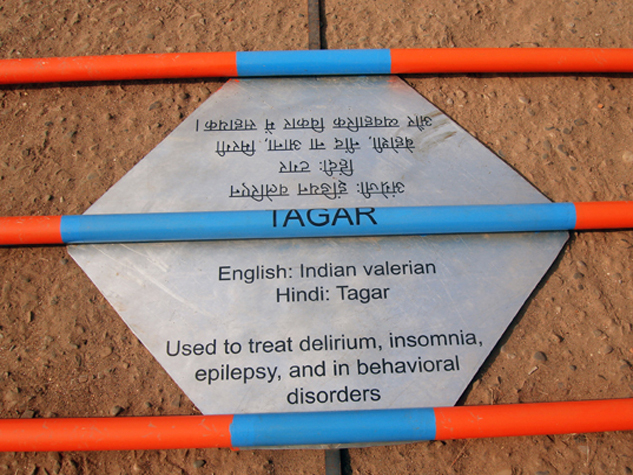 At the center of each unit was a tin sheet outlined in blue pipes containing the name of one of the medicinal plants with text in Hindi and English describing its use. 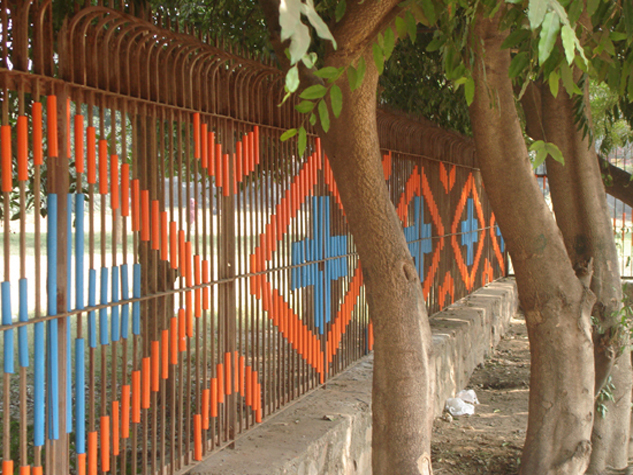 Looking out over the earthen surface of the park paved with orange and blue linear elements, the image of threads accumulating to create a pattern was evoked. 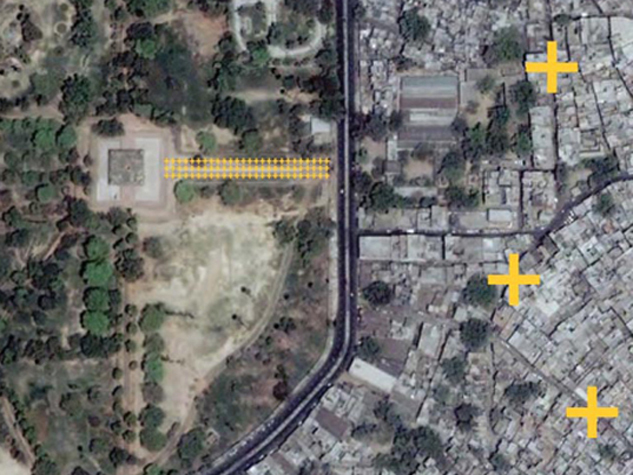 As the city of New Delhi modernizes and implements policy decisions to create cleaner air, for instance, neighborhoods like those adjacent to this park have suffered as textile plants, markets and other industries have closed. Looking at issues of sustainability, it becomes apparent that it is important to consider issues ranging from the micro to the macro scale. 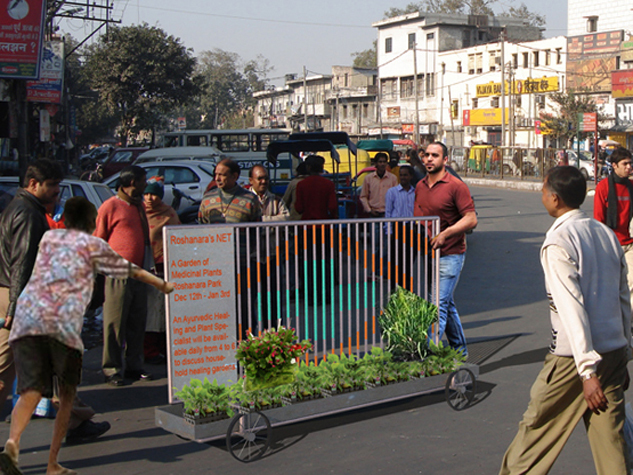 This project focused on the small scale—the health and well being of the individuals and their communities. 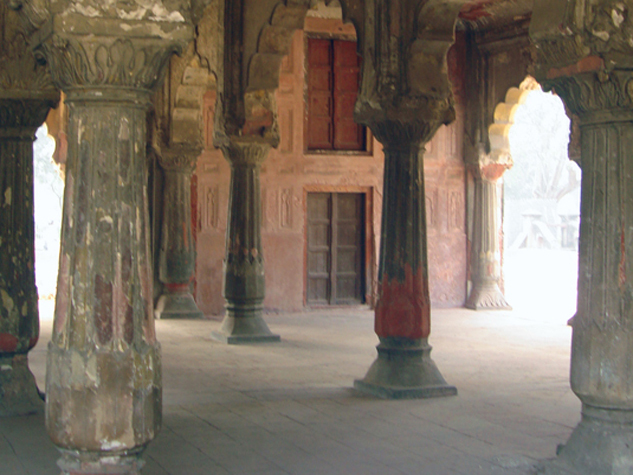 After initial visits to Roshanara and its neighborhoods a number of questions came to mind: Could this rather neglected archaeological site become more of an amenity to the community (and by implication, could the many heritage sites found scattered throughout the city become assets to their immediate neighbors)? Could the place be used by a more diverse group of people including women and children? By radically transforming the site for a short period of time, giving it a new use and meaning, is it possible to choreograph a different pattern of urban space, to create a map of that area other than the one that is currently understood? The idea of the garden was taken beyond the boundaries of the immediate site. 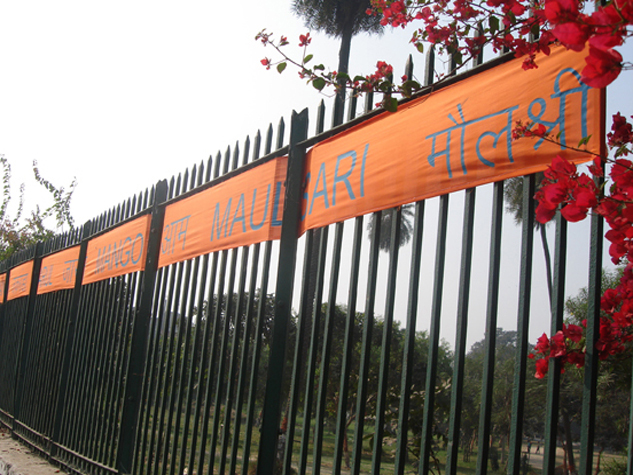 A quarter-mile of fence along the park’s eastern perimeter was wrapped with a band of orange cloth naming the medicinal trees in English and Hindi to be found in the park. 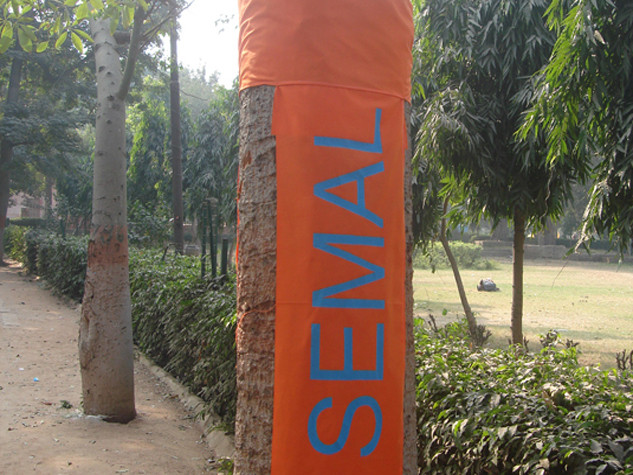 Inside the park itself those trees were banded and named with the same material. 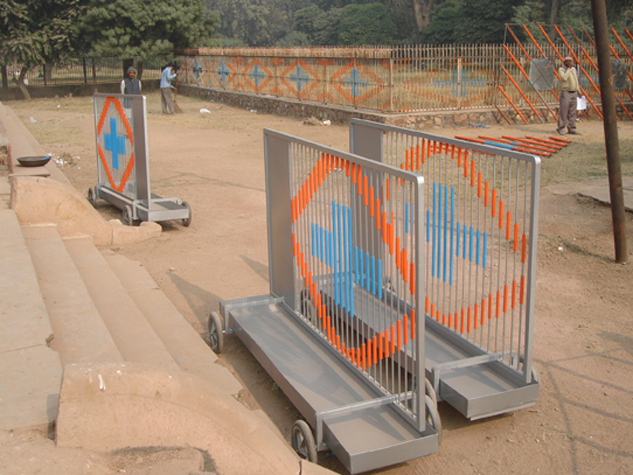 Three “Portable Parks” —wheeled carts carrying medicinal plants—were transported around the neighborhood to announce the times and dates when Ayurvedic specialists would be speaking at the garden, where 2000 plants lined the base of the pavilion. 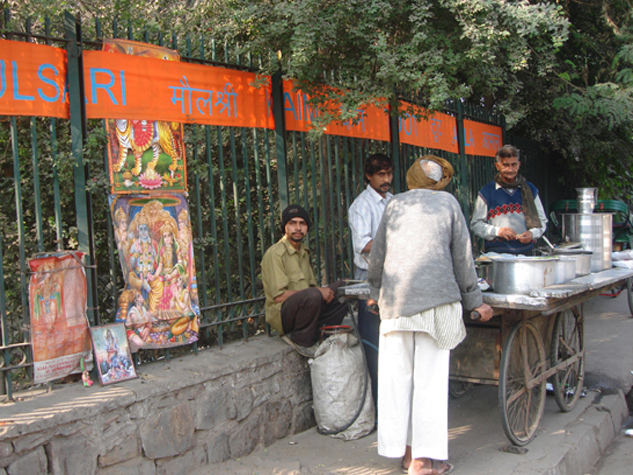 A new set of connections have been made between Roshanara’s tomb and the neighborhood. A temporary net has been cast between the two. 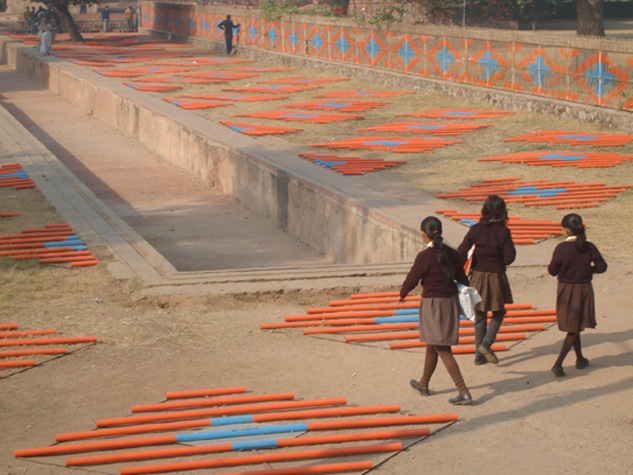 This project was part of the exhibition 48°C Public Art Ecology that took place in December, 2008 in New Delhi, India. Please see the attached PDF for images from the project.